Holiday Let Villas and Apartment Rentals in England, England. England is part of the United Kingdom and its capital is London which is on a tidal river, the river Thames. The city has its own airport, London City Airport, which is directly linked to the rest of London by the Docklands Light Railway which connects to the main rail network at Canning Town. It is also linked by road and bus. Other airports that serve London are Heathrow which is connected by tube (metro), rail, bus and road and is located at the far west of Greater London. Stansted, which is in Essex and is connected by road, bus and rail and Gatwick in West Sussex with road, bus and rail connections.London has a wealth of history, culture and entertainment. You will always have something to do. It is a pleasure to walk along the banks of the Thames or across it on one of its many bridges, admiring the many views. Trafalgar Square has now been divested of its pigeons and is a safe place in the middle of busy roads taking you to all parts of the city. On one side of the square in the National Gallery and next to it is the National Portrait Gallery, both of which should not be ignored. If you start here, you will be in walking distance of a large number of famous sites, as well as shops, restaurants, cafes etc. Central London is made up of many districts and does not reflect just one style. There are Victorian Gothic-style edifices which are seen at some of the railway stations and museums, Regency houses in the Regent's Park area and then there is St. Paul's Cathedral which is really a melange of styles first used by Sir Christopher Wren. Wandering round in various directions from Trafalgar Square you will come across Covent Garden, which was originally a fruit and vegetable market and is now an area with interesting shops selling a variety of things from retro clothing to cheese. This area also contains some of the famous theatres and is famous also for its street performers. Central London is also blessed with wonderful parks, including Hyde Park which actually permits horse-riding. Other central parks are St.Jame's and Regent's Park. In the further reaches of London, there are some fine open spaces such as Hampstead Heath and Richmond Park which is near the river and is fantastic on summer days. Nearby to London are a number of places you can visit for the day either by car or train. Oxford and Cambridge are both linked by rail and are beautiful places with exceptional architecture. Brighton, which is on the south coast is within easy reach of London as are many other places such as Tunbridge Wells, Canterbury, St.Albans and Berkhamsted where Graham Greene went to school. well as inland areas of outstanding beauty. Many of the areas are connected by train although you will need a car in most cases to get to your holiday home and to get around while you are there. Cambridge is an amazing place which has been a seat of learning for hundreds of years. Cambridge’s first college was established in 1284 Many of the buildings are mediaeval as are the many narrow, cobbled streets. By the River Cam are the meadows which you can stroll through and marvel at the fact that places like this still exist. Cambridge has a wealth of theatres which put on great plays and performances, galleries, museums as well as pubs, cafes restaurants and interesting shops. It is within easy reach of London and the rest of most of the East of England. Don't miss it. If you are interested in history or aviation, The Imperial War Museum, Duxford, the best aviation museum in Europe is just outside Cambridge. The Spitfire and Concorde are found there and much more. Ely, on the Isle of Ely which is actually no longer an island has a cathedral that is visible for miles due to the flatness of the area. The cathedral dates back to the 11th century having outstanding architectural features. The town has narrow little streets and historic building making Ely a charming place to visit. There is even a marina on the riverside. It is possible to actually climb up the cathedral's West Tower from the months of April to October where you will get a breathtaking view of the area. Nearby Wicken Fen National Nature Reserve is an example of the fen landscape. The Fens have their own unique character while the people have their own dialect. Wisbech, in the heart of the Fens on the River Nene has interesting historical links. King John's treasure, which was lost in the Wash and some hope to find it still. Thomas Clarkson, the social reformer who campaigned against slavery was born and educated in Wisbech. Wisbech became a successful commercial town when the Fens in the area were drained. The town of Wisbech is the home of some outstanding Georgian architecture on either side of the River Nene. Lincolnshire is a large county that is mostly rural. Its capital is Lincoln which also boasts a renowned cathedral which is about eight-hundred years old. Lincoln also has its Fens as does Cambridgeshire. After Lincoln, the next largest places are Skegness which is a very popular holiday resort, Spalding, which is famous for its horticulture, Stamford and Louth. A charming feature of the area is its weekly markets which has been made more popular and successful by the advent of farmer's markets. Some places of interest, apart from Lincoln, are Donington, Chapel St Leonards, Ingoldmells, Heckington, Sutton-on Sea and Wainfleet. Skegness has long been a popular resort for internal tourists and there are a wealth of sites and property to rent as well as hotels and bed and breakfast establishments. It has a huge sandy beach which is great for long walks, making sand-castles and donkey-rides. Skegness is a fine resort for families with children which is why Butlins built a resort there decades ago. Apart from a beach, there is a multitude of attractions and facilities as well as a pier. Skegness is also a good place to base yourself to explore other places in Lincolnshire such as the many villages in the rural Fens and Wolds. Horncastle has Roman origins are some of the wall's remains are still on view in this charming market town in the Lincolnshire Wolds. It has become a popular centre for antiques and the like and is fun to stroll around while you try to spot a bargain. It has a canal called the Horncastle Canal, but it has not been kept up and is at present navigable. There are a number of fine properties and establishments waiting to welcome you in and around Horncastle. This area is also an ideal base for cycling and walking holidays in Lincolnshire and specifically the Wolds. A number of nature reserves are also found in Lincolnshire especially the Fens including Gibraltar Pont, Saltfleetby and Theddlethorpe. Traditionally, the area has kept up with many of its pursuits due to its rural nature. Fishing and shooting game are still carried out in the area. Suffolk, with its capital Ipswich is a beautiful, rural county with a large coastline and wetlands. It also boasts forest land and remains from pre-historical times including the Stone Age, Bronze and Iron Age. Thetford Forest Park is on the borders of Norfolk and Suffolk. The nearest villages are Thetford and Brandon and the forest is in the middle of Breckland. Major roads leading there are the M11 from London, the A11 from Norwich and Newmarket and the A14 from Cambridge or Ipswich. Suffolk had a violent and tumultuous history which is illustrated in its many castles which can be seen today. Examples can be seen at Framlington and Orford. Other ruins are also found at Bungay, Wingfield and Eye Castle. Later edifices of great beauty date back to Elizabethan, Tudor and Georgian times. Re-enactment groups are active in the area, bringing to life past historical events. The Anglo-Saxon village at West Stowe has been reconstructed while the burial site of the East Anglian kings at Sutton Hoo is an example of Anglo-Saxon culture. Many other examples of historic houses, churches, abbeys, priories and guildhalls are all witnesses to Suffolk's fascinating history. Norfolk's capital is Norwich which is topped by a castle on its highest point. It was settled in pre-Roman times, while the Romans built roads and ports. The Angles, who gave their name to the area, settled the area later. An interesting site from the Neolithic age is Grime's Graves which is a flint mine and is open to the public. It is located seven miles from Thetford. In the Middle- Ages, the area was developed into an agricultural and wool-producing area. In the 20th century the area played a role in aviation starting in the First World War and then expanding in the Second World War.Norfolk is home to the Norfolk Broads where many species of birds can be seen while boating holidays are also popular there. Norfolk is home to King's Lynn which is a charming town on the River Ouse and is near a lavender producing area which is outstandingly beautiful when it is in bloom. In the middle of the town is the church of St. Margaret in the Market Place where the Guildhall still stands. The town is also populated by medieval storerooms and merchants' houses and the Custom house on Purfleet Quay. Sandringham, one of Queen Elizabeth's II's homes is also in Norfolk and is now open to the public, it is well worth visiting offering the public lots of information of a variety of subjects including farming and land management. Website:http://www.sandringhamestate.co.uk/ Great Yarmouth on the coast of Norfolk is a traditional sea-side resort with long sandy beaches in the area with a coastline of dunes as well as cliffs. The town is close to the Norfolk Broads and Norwich and has all the attractions of a sea-side resort from mini-golf, a long parade and a rollercoaster. Bridlington is a delightful town in North Yorkshire having duel attractions of being both a spa and a sea-side resort. It has a long history dating back to William the Conqueror who confiscated the manor of Bridlington. It was mentioned in the Doomsday Book under is older name. It has been called Brellington, Britlington, Bretlington and Burlington in the past. We can ascertain that Bridlington has long been catering to visitors as in 1896 donkey rides were introduced on the beach and the new spa and gardens where opened in this year also. Bridlington has a wonderful sandy beach as well as promenades and gardens. There are a number of places to visit in Bridlington such as the Park Rose Pottery, Cruckly Animal Farm and the Heritage Museum as well as Bondville Miniature Village. There also more modern places to visit if you feel so inclined such as Bridlington's Leisure World and the John Bull World of Rock. Of course there are funfairs, arcades and a road-train too. Bridlington is also the home to a beautiful, stuccoed Italianate crescent which was built in the 1870s. As most of the crescent has been turned into accommodation, it is possible to stay here where you will be right at the heart of things while in a genteel setting. In the immediate area around the town are Sewerby Hall which has outstanding landscaped gardens and natural ravine known as Dane's Dyke. Further along the coast is the old fishing village of Flamborough while nearby are York, with its wealth of history and countless places of interest for the visitor, Scarborough and Beverley. Pickering is at the centre of Ryedale, in North Yorkshire it is between Scarborough, Whitby, Helmsley and Malton. The North Yorkshire Moors Railway begins here and the town is known as the 'Gateway to the Moors'. The town has an old castle, the ruins of which can be found in the high reaches of the town while church of St Peter and St Paul is home to some wall-paintings of particular interest. Scarborough is a grand resort which has been functioning as such for around 360 years. It boasts outstanding beaches on both North and South Bay. Places to visit and things to see there include Scarborough Castle, the spa, the Sea Life Marine Sanctuary, the Rotunda Museum and Scarborough Art Gallery. Scarborough Spa has entertainment venues including the Grand Hall and the Victorian Theatre. Scarborough also offers quality restaurants, shops and cafes. Whitby is a charming town on the in coast of North Yorkshire which is dominated by the abbey high up on the cliff top. If you have read Bram Stocker's Dracula you will also have heard of Whitby. Whitby maintains a charm of yesteryear while catering to the visitor. Spend a day here at least and don't forget Robin Hood's Bay nearby if you want a treat. Harrogate is a large, prosperous spa town in North Yorkshire. It is home to Betty's Cafe! Before the beneficial waters were discovered in 1571 by William Slingsby, it was a small village and of no real significance and only gradually became this grand resort so popular with the higher realms at its peak in the late 19th and early 20th century. The town of Harrogate is blessed by a large park called the Stray which goes through the main area of the town. These days, Harrogate is a leading centre for conferences and trade fairs. Leeds played a leading role in the Industrial Revolution and is now experiencing a resurgence as an arts and cultural centre. Being a large, cosmopolitan centre, Leeds offers a wealth of cuisines and accommodation to suit all pockets. The charming spa town of Buxton dates back to Roman times and is located in the beautiful Peak District making it a great place to explore the surrounding countryside and visit nearby attractions such as the outstandingly grand Chatsworth House, Hardwick Hall, Alton Towers if you have a young family and Haddon Hall which dates back to the Middle Ages. Buxton's wonderful Opera House was built by the acclaimed architect, Frank Matcham at the beginning of the last century and has been recently restored to its original style and decor featuring celestial themes with elaborate detail. The Opera House at Buxton offers a wide variety of events that will appeal to all. 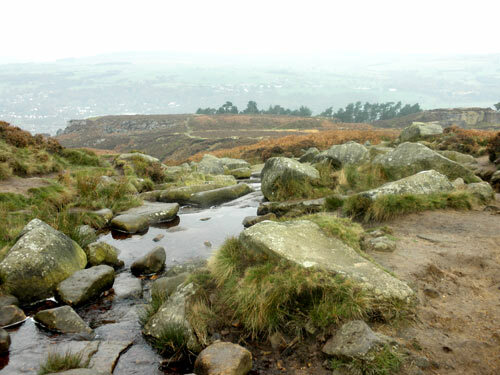 The area offers great walking and mountain-biking in an area of outstanding natural beauty and interest as well a being historically significant. Apart from its aristocratic edifices, the area was also a major player in the Industrial Revolution. Visit the Silk Mill at Silk Mill Lane Derby which is were the Industrial Revolution began and is home to the Museum of Industry and History. Bakewell has been an important strategic and commercial place and is still a beautiful market town on the River Wye which is straddled by a 13th century bridge that is still used although it was modified over a hundred years ago. It is home to All Saints' Church which dates back to Saxon and Norman times after which the main remaining stonework was added in a few hundred years later and then restored about a hundred years ago. The church contains monuments to some local nobles which are of particular interest. Buxton is also said to have connections with Jane Austin who is supposed to have stayed there while writing 'Pride and Prejudice' The area is home to Crich Tramway Village which is home to the National Tramway Museum and Bolsover Castlewhich is set in a fantastic location on a peak above the Vale of Scarsdale. This castle has attractions for all ages with specific attractions built to entertain and educate children while having a multitude of individual sites plus audio-visual displays and medieval jousting re-enactments. Farm & Cottage Holidays - specialist in self-catering holidays throughout the West Country. The West Country brings to mind ancient stories and legends as this was where the Ancient Celts were pushed over time. Cornish was a living language until recently and many people from Cornwall still have a very strong local heritage. The area may have had links with very ancient civilizations such as the Phoenicians due to its mines. Stonehenge and Avebury are located in Wiltshire and date back from the Neolithic era, both sites are composed of megaliths arranged in a circular fashion and even though the arrangement pertains to astronomy, the exact significance is not known Torquay is on the coast of Devon which is known as the English Riviera. Torquay formerly based its economy on fishing and agriculture until it started to become popular with visitors in the early 19th century as it was known to have a climate efficacious to health. Torquay and the surrounding area have a plentiful supply of places to stay including privately owned homes, bed and breakfast and fine hotels. The area is home to nine beaches and it set in a lush hilly area with pleasant views while the promenade is flanked by palm-trees. There is also an abundance of retail outlets, pleasant cafes and very good restaurants. Truro is a busy Cornish cathedral city on three rivers from which the city derives its name from the Cornish Tri-veru (three rivers), the rivers are the Truro, Kenwyn and Allen. Georgian streets and 18th and 19th century houses combine with the cathedral and other buildings from past-times to create a compelling and attractive town. Truro was formerly a tin port while today it is both a commercial centre and a resort for tourism. In Truro you can visit Truro Cathedral which is modern for a cathedral having been started in 1880 The money with which is was built was raised by the public. One can visit and get guided tours. There is also a gift shop and a restaurant in the Chapter House. The City Hall houses the Mayor's Parlour and Truro City Council offices and is of Italianate design. You will also find the Truro Tourist Information Centre here. The Royal Cornwall Museum on River Street is both museum and gallery and is worth going to. Collections depicting Cornish history from the earliest times, the Rashleigh mineral collection, pottery, including work by Bernard Leach, and natural history exhibits are featured there. The art gallery includes paintings by the well-known Cornish artist John Opie. There are also visiting exhibitions throughout the year. It has a shop and cafe. St Agnes is a great place for body-boarding and surfing as well as being a charming, picturesque, traditional Cornish village with four beaches in the immediate area. Visitors are catered for here with a number of local shops providing supplies as well a craft shops, galleries and workshops with in-house gift shops. St Agnes is also a resort which caters to visitors throughout the year. The village has a history of tin mining that dates back for hundreds of years and still produces today. Poole is close to Bournemouth and is a resort and working town which is also close to the New Forest and the charming inland and coastline areas of Hampshire and Dorset. Bournemouth is a busy town in its own right as well a superb resort and centre for conferences. It has a large sandy beach benefits from a warm climate that has pulled in permanent residents from all over the UK. Poole, Sandbanks and Bournemouth are places where you can base yourself where you can enjoy all the facilities of a large city whilst visiting outstandingly beautiful places such as Man of War Bay, Durdle Door, Lulworth Cove, Corfe Castle, the New Forest which itself contains a plethora of places and activities including the Beaulieu Motor Museum. Dartmouth, a charming town on the River Dart is home to beautiful medieval houses on narrow streets of galleries, restaurants crafts and antique shops overlooking the estuary. Dartmough hosts a regatta each year and is also a fishing port. Buildings of interest to the visitor from historical and architectural aspects are numerous in Dartmouth. Overlooking the town one finds the Britannia Royal Naval College which is open to the public. Visit Dartmouth Museum housed in a former merchant's house built in the 17th century or take a trip on the beautiful River Dart. On the coastal side there is a grey seal colony. Newquay has a wonderful coastline which attracts all types of visitors. It is also very popular with water-sport enthusiasts. It is also where you can find very good restaurants and cafes where the catering is of a very high standard. Newquay is connected to the rest of the UK via air, rail and road. Some places that you may want to visit whilst in Cornwall are: The Eden Project which has large bio domes and gardens. It is also an educational site for educational purposes. Tate St Ives, which a major gallery of international and contemporary art including works from the Tate Collection, Barbara Hepworth and Terry Frost, The National Maritime Museum at Falmouth, St Michaels Mount which has a medieval castle built on a tiny, rocky island with a great historical legacy whilst still hosting a working community and Crealy Adventure Park which has adventure rides. cyclists, walkers and families. Bude is where some of the best surfing beaches are found while the surrounding area is an area of outstanding beauty. Bude and the surrounding area has a high standard of accommodation in all categories. Axminster is a small market town in Devon which reminds most British people of carpets when they hear the name which although made here are now also made globally. The town is located on the River Axe from whence its name derives. The town dates back to when the Celts arrived about 300BC and was then improved by the Romans. The town's carpet industry begun under the Thomas Whitty in 1755 when the completion of a carpet was announced through the ringing of bells from the nearby church. Some places of interest in and around Axminster are Axminster Museum, Backdown Hills, Forde Abbey and Musbury Castle. The southern part of England offers resorts and places of interest including delightful coastal towns and villages on riversides in the heart of the countryside. The area is within easy reach of London and many of the ferry-ports such as Southampton, Portsmouth, Dover and Folkstone. One of the most popular and and lively places in the south is Brighton which is charming. Wander around the Brighton Lanes and visit the Brighton Royal Pavillion which has a Mogul influences and was built by the Prince Regent at the time who later became King George IV. Also of interest in Brighton is the Brighton Aquarium which is the oldest in the world. Portsmouth is a naval centre and port and has much to interest the visitor. It is also where you can catch the ferry to the beautiful island of the Isle of Wight which is home to Osborne House where Queen Victoria often resided and at which you can see the cottage she built for her children to play in, Carisbroke Castle where another royal met his end, Tennyson's Down, Alum Bay and many more beautiful places. Visit the Historic Shipyard and at Portsmouth as well as the Charles Dickens Birthplace Museum and the Natural History Museum that features wildlife habitats in Portsmouth. For an envious vista over the immediate area, scale the heights of the Spinnaker Tower and then ,once on shore head to the seas's edge and explore the Old Sea Walls after which you may be interested in what lies beneath the waves at the Blue Reef Aquarium. Of course, Admiral Lord Nelsons's HMS Victory is found here at Portsmouth as well as the Mary Rose. If you wish to become better informed about English Maritime history, don't miss Portsmouth. A place on the River Hamble of particular interest to nature lovers and ornithologists is Hook with Warsash Local Nature Reserve with over 500 acres at the mouth of the river Hamble, including intertidal mudflats and a shoreline almost 3 miles long. There are a variety of habitats of which some are regionally rare and declining. Access to the reserve is via a network of public footpaths. The two public car parks close to the waterfront at Warsash are an ideal starting point. Southampton is now prime place to visist for lovers of all the arts as it has some great venues and galleries which cover works of art from the past and present, drama from Shakespeare to the present day, and music from Puccini to Pulp. The City Art Gallery is home to the pictorial arts covering centuries of painting works, while the Millais Gallery hosts works from newcomers to the field of art and design. The Mayflower is a huge theater able to stage musicals, ballet and opera and the University's Nuffield Theatre hosts drama from all eras. Musical venues include the Turner Sims Concert Hall and the Guildhall. Southampton is not just a transit point, it is a place to remain in for a while where you can relax in pleasant but stimulating cafes and enjoy the arts.